If you have a tendency to eat a lot or feel hungry at night time, you are sure to hurt your weight-loss goals. I do eat normally every night, but I hardly ever eat anything after dinner. Let me give you my best tips to help you change this bad habit and finally regain control over food and over your weight without dieting. Sara stopped binge eating every night in just 5 days (and she couldn’t believe how easy it was). Click here to grab your free copy of Sara’s case-study + access explanatory video so you know how she did it. Make sure that you have a satisfactorily nourishing breakfast and lunch, and maybe some fruit in the afternoon. Whatever you do, eat enough food. I know it’s part of the English and American cultures to gulf down a quick sandwich and some soda at lunch. When I did that while I was living in the UK or the US, I was always hungry, snacking afternoon and night, and I gained a lot of weight instantly. Please add a little French touch to your lunches: Take the time to eat a real meal at lunch time sitting down at a table. If you take too much sugar at dinner time, you increase your chances of craving sugar a few hours later. If you feel like a sweet dessert, make sure you have eaten enough. Have a piece of fruit or some salad, and then have dessert—and it’s best to make your own! Commercial desserts have way too much sugar and chemicals in them. By all means, don’t drink fruit juices, milk, sodas, and sweetened coffees or teas after 4:00 p.m. This will give you a sugar rush and diminish the quality of your sleep. You may drink water at night. It prevents cravings, but make sure you wait at least two hours after dinner. And I mean don’t drink anything other than water—not even herbal tea!—because boiled water doesn’t have the same health properties. If you don’t believe me, try watering your plants with cooled boiled water for two months. You’ll see that boiled water and regular water don’t hydrate the same way at all. I like to have raw cabbage salad, a grated coconut dessert, and other high-fiber food to help me feel satiated easily. Sometimes, my hormones make me a little hungrier so I eat more, but I use water and high-fiber foods to regulate my appetite. Eat food that is rich in water throughout the day. This includes salad, raw vegetables such as cabbage, and a little fruit. With time, this will have a huge impact on your cravings, your hunger, and your health. You will feel full faster and your body will thank you, because the best way you can hydrate it is by eating water-rich food. Now that I have shared with you all the simple food tricks I use to prevent the late-night munchies, here is how you curb the emotions and stress that craving nighttime snacks brings on. This may seem quite simple but you have to adopt the habit of eating at a table—and only at a table. I don’t care if you binge eat at a table right now. Eating at a table and looking at the food will cure mindless eating in no time. This means no eating in front of the TV, and no standing. Eating must be somewhat sacred if you want to control your weight. In other words, give your body the respect it deserves by being fully present when you eat. Take your TV outside the kitchen, or switch it off while you’re eating. Once again, your purpose is to be fully present when you eat. Take at least 30 minutes to eat slowly and let your mind cool off. Give yourself time to savor and chew your food. Eating can also be an occasion to connect with the people you live with. Make dinner time and eating an important moment of your day. You may be tempted to eat after dinner time. Often, boredom, stress, or other unpleasant emotions resurface at night. To prevent stress eating, practice a very simple stress relief technique eight minutes per night. I give my newsletter readers full instructions on how to do this, so, if you haven’t subscribed yet, do so now by filling out the form at the bottom of this article. I have created a very thorough article on how to stop boredom eating. You can read it now. I think boredom is just another layer covering some deeper emotions—and this includes stress, so make sure to lower your stress levels as well. Also, take some time for yourself to peacefully look at what’s hiding behind this boredom. Boredom and watching TV and keeping yourself distracted or comforted with food are ways to escape emotions that emerge from an unhealthy belief system. There is a more advanced coaching technique that deals with this, and I won’t be able to discuss it fully here, but please read the part in my article about finding beliefs and setting goals. If you apply this principle with the relaxing technique I give you, you will experience a swift and solid improvement in your nighttime eating syndrome. Without daily activities to distract you, you may feel the discomfort of negative emotions more intensely. You may choose to lower the intensity of these emotions with one of the techniques I give you when you subscribe. It will work really fast and you’ll be able to let go of your cravings quickly. You may even decide that this is a great opportunity to get to know yourself better and see what unmet desires you’re trying to make up for with comfort eating. I think either technique is good, but the second technique will bring you much longer results. If you want to learn how you can nurture yourself with self-love rather than with food and stop emotional eating, visit this page now. 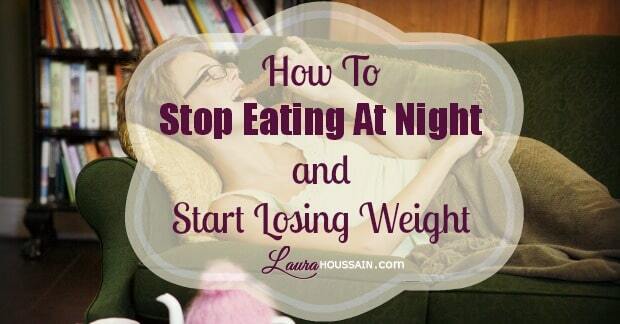 I have given you very powerful tips on how to stop night eating. Now it’s your turn to take action. Write down everything you are going to do differently tonight and tomorrow night. Put the list on your fridge and look at it before dinner time. If you haven’t done so, click here to subscribe to my newsletter and get free access to this super gentle eight-minute technique that will bring you peace of mind and control over food like you’ve never experienced before.